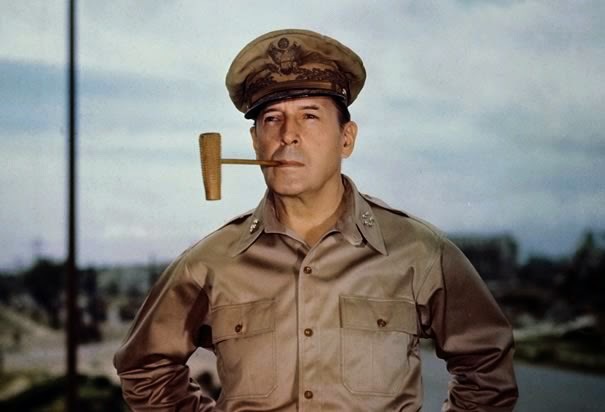 One of General Douglas MacArthur's trademarks was his corncob pipe. The Missouri Meerschaum Company, in business in Washington, Missouri, since 1869, made MacArthur's pipes to his specifications. The company continues to produce a corncob pipe in his honor. From our Ozark Mini to the stately MacArthur, our Genuine Missouri Meerschaum Corn Cob Pipes are the coolest, sweetest smoking pipes you’ll ever find. With a variety of sizes and shapes to choose from, you’re sure to find exactly the right pipe for your smoking pleasure. Washington, Missouri has long been known as the “Corn Cob Pipe Capital of the World.” And, in fact, The Missouri Meerschaum Company – the world's oldest and largest manufacturer of cool, sweet-smelling corn cob pipes – began the tradition for which Washington became famous. In 1869, a Dutch immigrant woodworker named Henry Tibbe first began production of the corn cob pipe. Legend has it that a local farmer whittled a pipe out of corn cob and liked it so much he asked Henry Tibbe to try turning some on his lathe. Because the farmer was well-pleased with the results, Henry made and sold a few more in his woodworking shop. Tibbe’s pipes proved to be such a fast selling item, he soon spent more time making pipes for customers than working with wood, and began full time production of corn cob pipes. In 1907 the H. Tibbe & Son Co. became the Missouri Meerschaum Company. The word “meerschaum” is derived from a German word meaning “sea foam.” Meerschaum is a Turkish clay used in high grade pipes. Tibbe likened his light, porous pipes and their cool smoke to that of the more expensive meerschaum pipes and coined the name “Missouri Meerschaum” for his pipes. Tibbe and a chemist friend devised an innovative system of applying a plaster-based substance to the outside of the corn cob bowls. In 1878, Tibbe patented this process. A nationwide distribution system was eventually established for the sale of Tibbe’s pipes. Other pipe firms also developed, so by 1925 there were as many as a dozen corn cob pipe companies in Franklin County, Missouri – most of them in Washington. Today, Missouri Meerschaum stands alone as the first and only surviving piece of this living history. These gentle pipes are smoked and loved all over the world as well as being used as souvenirs, often imprinted with the name of a city, business, or event. 2. A Missouri Meerschaum corncob pipe. 3. Two plastic pouches of Danish Borkum Riff – Mixture with Bourbon Whiskey. As I have written here I smoked a pipe until 1994 when I simply lost interest. 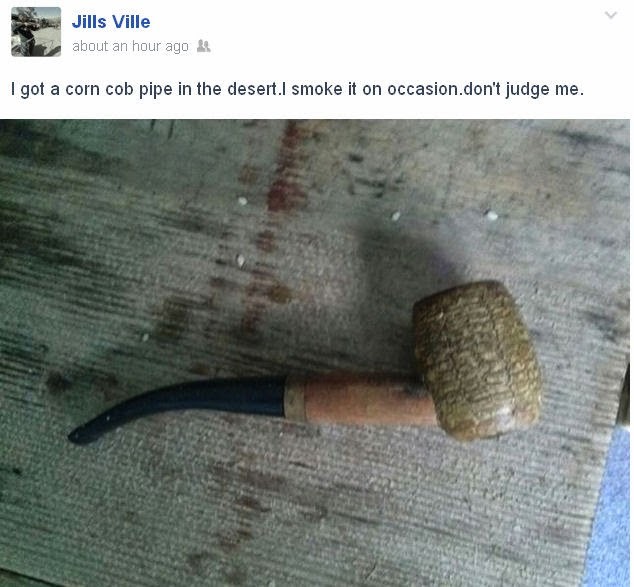 Today while cruising facebook I found that one of my friends (I have hazy recollection of her face being familiar) Jills Ville had posted a picture of her corncob pipe with an interesting statement. Upon seeing the image I was accosted by a terrible nostalgia for my mother and the very day when she handed me my presents. In 1970 I was not too sophisticated in my pipe smoking tastes and I was genuinely fond of the aromatic Borkum Riff she gave me. Previously I had been smoking a sweet concoction called Middleton’s Cherry Blend. It was only by the 80s that I smoked “better” blends that were not sweet like Three Nuns, Edgeworth and Balkan Sobranie. 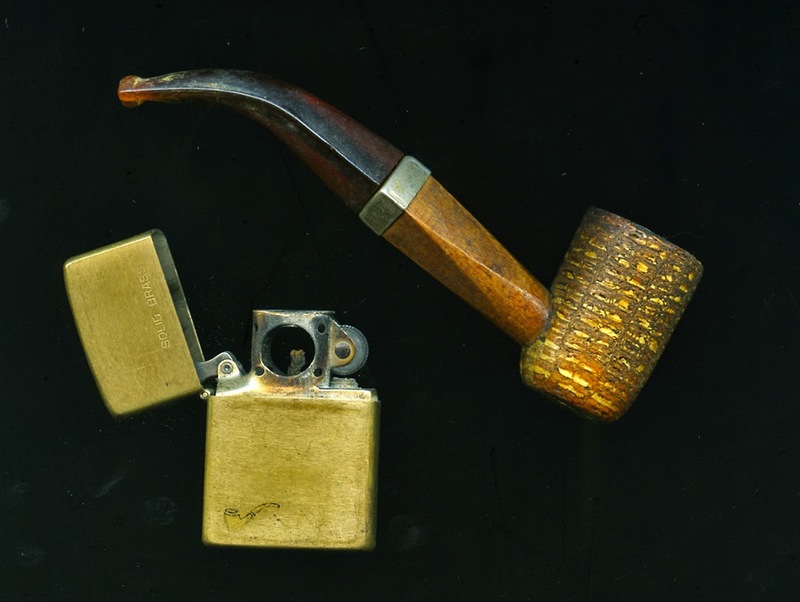 I am including in my scan of my corncob pipe the brass Zippo for pipes. A strict connoisseur would have never used such a device to light a pipe as the initial fumes would taste of Ronsonol. A true connoisseur would use wooden matches. I include the Zippo because in the mid to late 50s when I was studying at St. Edward’s in Austin, Texas I would buy my mother a Christmas gift. Many times it consisted of a pre-Zippo but similar Storm King. No matter how rugged my mother had the talent of breaking lighters and wrist watches. My Rosemary inherited the talent for watches. Jills Ville says we have friends in common. Most of them are punk and/or alternative scene musicians of the early 80s. She tells me that she lived at The Plaza on Georgia Street. D.O.A. lived at the plaza and I went there a few times. 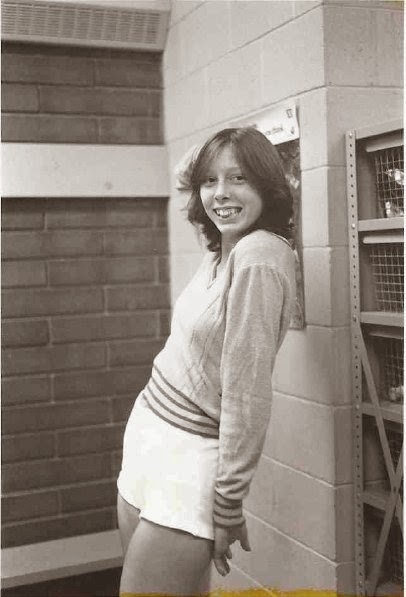 This is why this picture of Ville as a young woman is familiar to me. I can only thank Ville for this jolt of warm nostalgia on an almost cold and dying day in a July summer. Who Doth Not Look For Night?